"Do you own a job or a system?" Robert Kiyosaki (Rich Dad Poor Dad) said the difference between owning a job and owning a business is creating a system. At the heart of any successful brand there is a system. At the heart of any system there is a magic formula. We show you how easy it is to conjure a magic formula! Marie Kondo created a super-simple system for decluttering your house and the result was the bestselling 'KonMari' brand, selling over 2 million books and making her one of Time's 100 most influential people. The Bullet Journal or 'BuJo' organisational method exploded onto the stationery scene in 2016, turning dot grid notebooks into bestsellers and flooding Instagram with pages of neatly planned days on paper. People's lives have been revolutionized by a code of 8-10 bulletpoints. Young Living's essential oils are an industry leader. Their $44 Thieves Oil is recommended for everything from carpet cleaning to tooth-brushing, while their $295 Aria Diffuser vastly outsells hundreds of much cheaper private label brands. What made these brands so successful? At their heart, they’re all built on simple formulas that can be quickly explained, understood and scaled. And for all of them, the sky is the limit for monetization. Do you look at trending brands or products and think "Huh. I could have done that!" Or maybe you think, "I wish I owned a brand like that but I'd need to be an expert"
Or maybe, "I'd need a lot of money to do that"
Or maybe even, "I'd love to build a brand but I'm just not that creative. I just don't have those ideas." Well, that's where this workshop series is designed to help you. Follow these three classes and not only will you proudly be able to say, "Yes, I AM Creative!" but you'll also be well on your way to owning a brand, a system and a portfolio of your own exclusive, saleable products. You'll feel ready to move beyond widget selling, with a new awareness of further options to build your brand including crowdfunding, licensing and next level marketing strategies. Magic Formulas is a series of three live online workshops. But don’t worry, if you miss a class, it will be available shortly afterwards as a replay. Creativity is hard. Following a formula is easy. At the heart of every great brand or product, there's a simple formula. This course provides you with a wealth of 'magic formulas' you can use as templates, giving you the confidence and inspiration to create anything from a simple digital product to a framework for your entire system. You'll also learn how to create your own 'magic formulas' and feel confident in using them. As humans, our lives are constantly under the influence of systems. Each day is measured in hours, our school experience is dictated by a timetable, our work experience by a schedule, our transportation by road rules. We follow exercise routines and diet plans. We celebrate birthdays with cake and Thanksgiving with turkeys… And this is the tip of the iceberg. Every event or activity in our lives is surrounded by rituals, symbols and methods. By understanding these systems, we can draw out the formulas we need to embrace, disrupt or build upon them and create completely new systems - and ultimately brands. Extensive resources to help you get your brand and products launched, including links to dozens of tools, recommended books, articles and much more. 'The Formulizer' - An exclusive piece of software to guide creative thinking, allowing you to formulate thousands of magic formulas, ready to be turned into brands and products. Our 'Find Your Expertise' worksheet tool. Learn how many hidden talents you have, ready to monetize! And of course, access to our Curate/Create/Magic Formulas private group. A group that is just the right size, busy, active and full of kindhearted, knowledgeable and creative members. This is just a taster of the topics you can expect to see in our classes. They're fast moving and information packed! Symbolism, sigils and oracles. A simple method to product creation. We go deep with topics like gamification - how do you create a system that is rewarding for your customers? How do you challenge them to commit more deeply to your brand? How do you make necessary tasks more enjoyable? We look at the rules for life. How do we tackle life transitions and special events and can we use them to create new 'traditions' centered around your product? We also look at how breaking those rules can create unique breakthroughs that can be converted into products. We look at how alchemy can create unique products by converting one medium into another. Bored of t-shirts that say, 'Best Mom Ever?' So are we. Instead, we ask how do you turn a favorite song into a piece of wall art? What does existentialism smell like? What would your mom's voice look like as a mosaic? We play with concepts, then bring them down to earth by creating unique products that can be sold on platforms like Amazon Custom. Do I need any previous knowledge or experience to take this course? I took your Curate or Create class. Will it help me? Yes! This class is designed to be a ‘next level’ for both of these courses. If you are already working on digital inventory or physical products, this course will help you build a solid marketing strategy for them and expand the range and quality of your products. I strongly recommend it for Curators/Creators and there is a discounted price just for you guys. Will I learn how to sell on Amazon/Etsy/GumRoad/Merch? This is a platform independent course and while we use various platforms as examples, this course is not a platform-walkthrough as there simply wouldn’t be enough time for all the Magic Formulas! If you would like to learn how to create physical products to sell on Amazon and Shopify (for example bundles, private and white label products), I recommend our Create Megacourse. If you would like to learn how to create digital products, such as t-shirts, books and information products to sell on platforms like GumRoad, CreateSpace and Merch, please take our Curate Megacourse. We also have a mini course ‘OnDemand’ if you are interested in selling Print on Demand products on Amazon Custom. You are of course also welcome to ask questions about any platform in Treasure Hunting, Blue Sky or the Create/Curate group if you are a member. This class is a great complement to any of the above. Will your class videos be available indefinitely? Yes! We keep all our classes online as long as there is interest. How do I take the classes? They will be broadcast live as Zooms and then will be archived as video classes to our exclusive, user friendly platform. If you are unsure about using Zoom, please ask Isaac or myself and we’ll make sure you’re set up for it! Not for this class. However, you are free to chat and ask questions in the Zoom during the class and we encourage forming ‘mini masterminds’ with fellow students. These have been incredibly powerful and productive in past classes. You can also get support in any of our Facebook groups - Treasure Hunting, Blue Sky or in the private Curate/Create group if you are a member. Private coaching/support is not included in the class or guaranteed but I always do my best to answer questions in the groups or by private message if I can. If I don’t like it, do I get my money back? Unhappy customers are thankfully very rare in our courses and I urge you to check our testimonials from previous classes to see our track record, but if you take the class and really feel it is not for you, we will of course refund you. I am always happy to work with you and answer your questions, so if you’re not sure about taking the class, please contact Isaac or me and we’ll do our best to help you. Where are the $$$$ screenshots and Lamborghinis? How do I know you’re legit? Our courses appeal to the whole spectrum of sellers, from newbies and hobbyists through to 6 and 7 figure sellers so success is very personal to each seller. I aim to help each student achieve their personal best and our testimonials speak to this. Isaac and I are both active Amazon sellers and we work full time selling online on a variety of platforms as well as researching marketing methods, building software, publishing books, coaching and teaching. We love to spend time with sellers, understanding the challenges you are facing an working with you to overcome them one by one. Will you teach this workshop to my group? Maybe! We’re looking to put together a calendar of real-time events. We taught a version of this class at ASD, Las Vegas and it was so successful, we ended up teaching it twice! Send me a message and we’ll talk about it. Any other questions? Please send me a message! 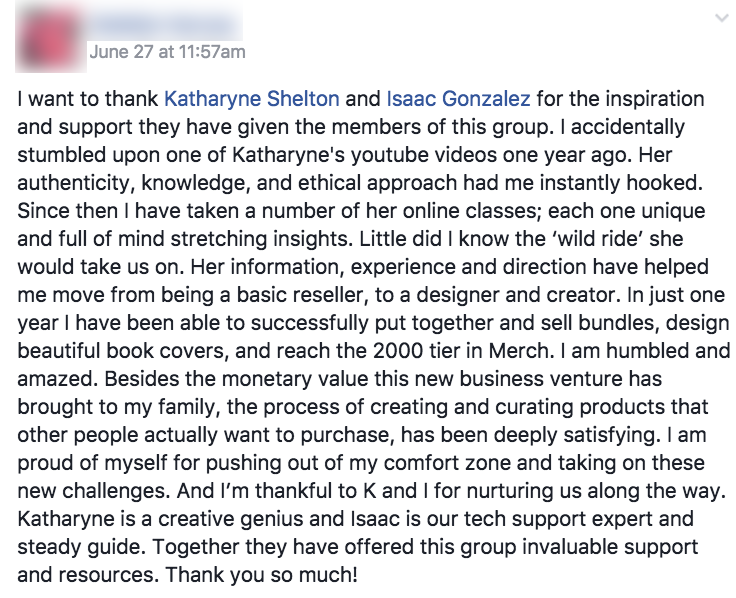 Katharyne Shelton leads the 16,000 member group 'Treasure Hunting with Katharyne' on Facebook. She has provided coaching, support and help to thousands of online sellers and is an expert in Amazon's policies and platforms. Her numerous product creation and marketing courses have reached hundreds of devoted students, many of whom have created successful products, books and bundles with sales that rival products from big corporations, getting her a reputation as a hitmaker. Her Treasure Hunting YouTube channel has 10,000 subscribers and has also guided countless new sellers on their journey. With a British MBA and a background in the arts, she is skilled in international marketing, sales and consulting but brings a unique level of creativity to her projects. She approaches teaching and consulting with a kind, empathic, playful and sometimes quirky approach, backed up with experience, knowledge and a pioneering approach to new ideas. She has sold on multiple platforms and currently focuses on Amazon FBA, CreateSpace, GumRoad and Merch. Her partner, Isaac Gonzalez is a professional web developer and an expert in eCommerce platforms, particularly Shopify. He has developed products for resellers including searchblast.net and SkyWords, using his understanding of marketing algorithms, keywords and SEO to create these powerful research tools.